Wayne and I are back at art school! 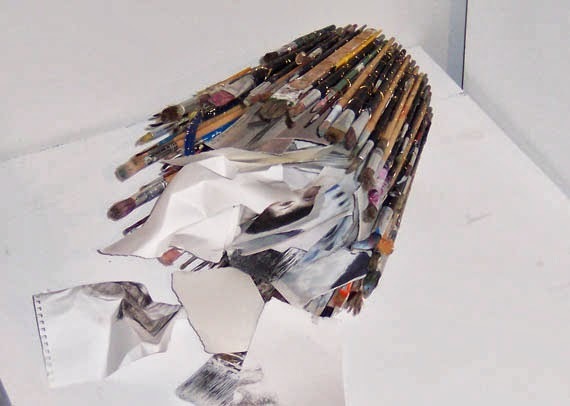 A few weeks ago we started a course on Art From Trash at the Tasmanian College of the Arts. The course has been great fun. Its about changing the way we look at things and how we express them through our art. Its about experimenting with our own work and not being afraid to step outside our comfort zone. I’m loving being back in a creative space like that, where art is all around you. 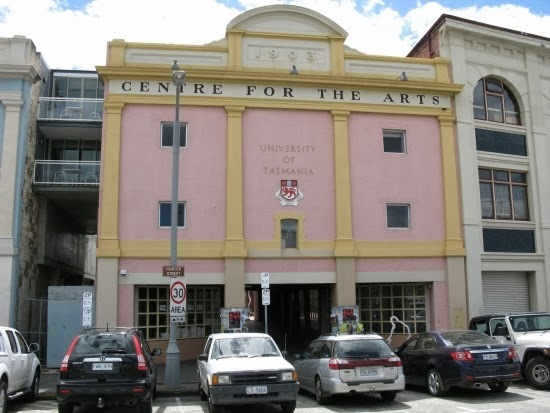 The art school is in a beautiful old building on the waterfront in Hobart, one of my favourite places in Tasmania. This week we had to present a minimum of 3 pieces of work and our journals to be evaluated. Next we have to give a presentation on our work and we’re finished. I have to tell you, I was really stressed about what work I would do for the course and was blocked because of my depression due to my hands being sore. In the end I stuck with my recycling and re-purposing theme, but with a slight twist. To make it ‘arty-er’ of course! I made my pieces from trash but I also made them slightly autobiographical. When the course started we were asked to pick three words which relate to our work and our interests. My words were Everyday, Surprising, and Remade. My interest always being in taking common objects and remaking them into something functional in a fun way. In order to step outside my comfort zone however, I had to take my words and step a bit further into the ‘art’ abyss. I’m not sure I quite succeeded, but I tried to make things which had no real function, rather made a statement. The Dead Art Basket was one piece, and really, it failed in the no function department. It was born out of frustration and gloominess about my work. 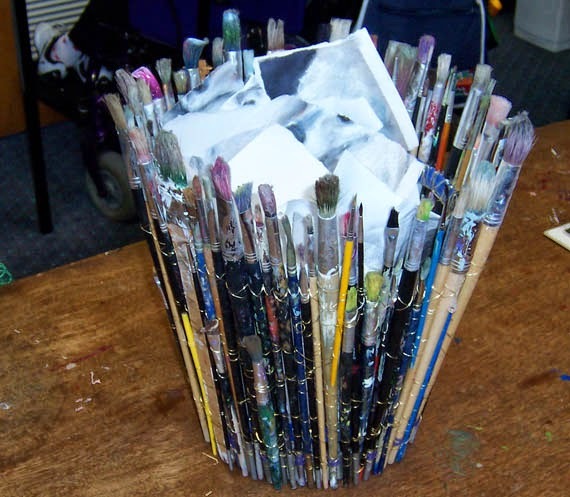 Its a basket made using ruined brushes, an old pie tin as a base, plastic rings off molasses buckets and wire. Inside the basket I tore up pieces of my work which I never finished because I hated. This is how I presented the basket at the gallery for evaluation. Next cab off the rank was something which is a big part of my life: dogs. 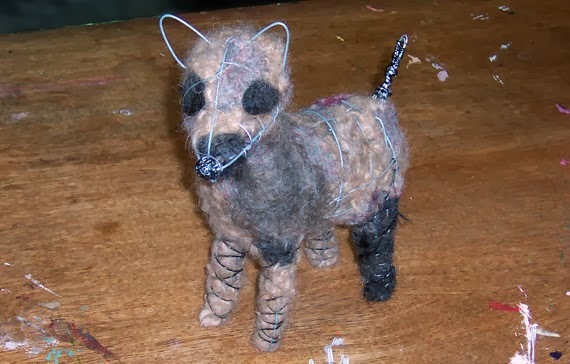 I made a dog figure using wire, dog hair which I felted, some possum fur I found in the woodshed and some dryer lint to add different texture and colour. I called this Hair of the Dog. 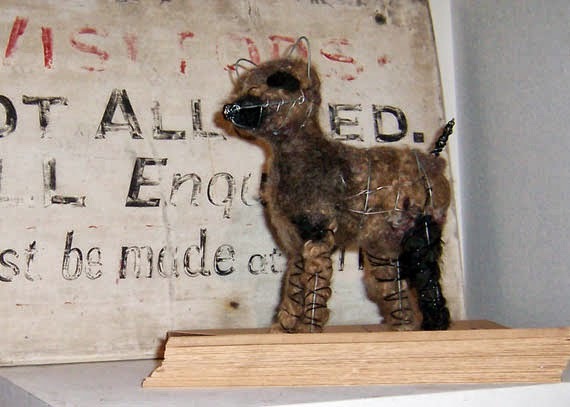 I decided to leave the wire exposed in places to show the structure of the dog instead of making him more realistic. 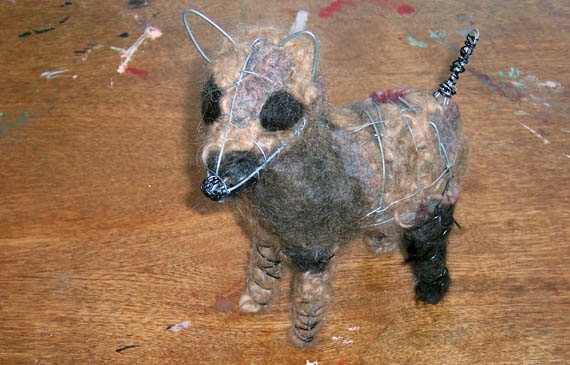 He’s kind of the Frankenstein of dogs isn’t he? His tail wags too. This is him in the gallery. On a dirty plinth. 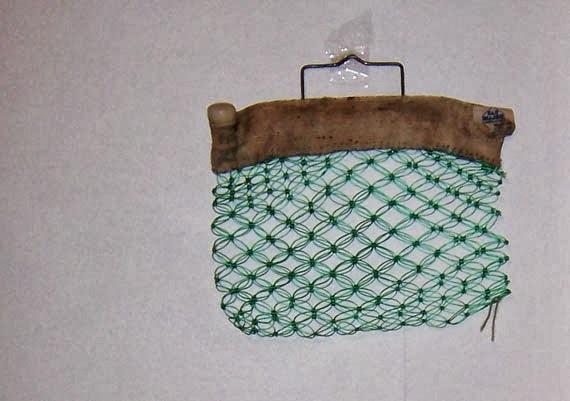 Last is That Won’t Hold Water, a humorous little piece composed of an old water bag and a retro net shopping bag. 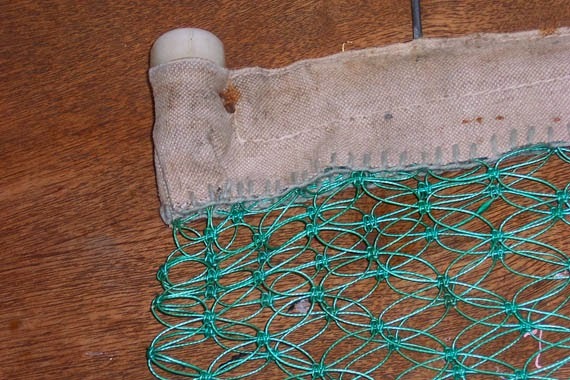 The old water bag was in the garage and I saw the net bag in a tip shop and couldn’t pass it by. I had no idea what to do with it at the time. There’s meaning to this piece as well… I mean there’s a connection to the piece and my life at the moment. Here it is in the gallery. Ignore the sticky tape attachment to the wall. Its not a REAL exhibition, just an exercise in setting out our work in order to showcase it and convey a message so I didn’t want to punch holes in the wall. My three pieces were all presented simply and rather starkly on white. I kept it simple. 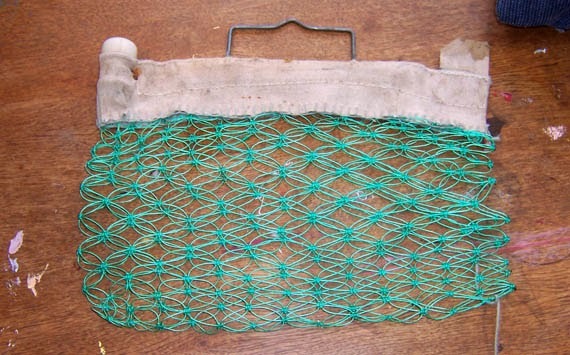 The common thread with mine was that everything except the wire and glue was rescued from, or destined for, the trash. Plus a bit of whimsy. I’ll share Wayne’s creations another time. He was a smarty pants. He presented FIVE pieces. This entry was posted in Craft, DIY by zefiart. Bookmark the permalink. I guess I didn't go back far enough!!! This happen to catch my eye as I was responding to today's entry. I love your pieces of art!! !, especially the brush bucket. 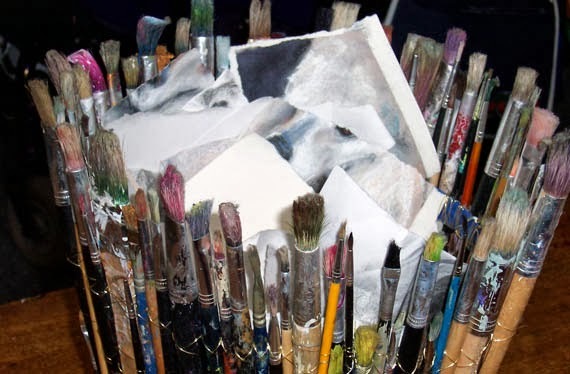 I must save paint brushes, but I don't paint that much. Maybe I will find brushes that someone else throws away. I will search for Wayne's art, too! Look at my Pinterest boards, you'll find the links to everything up top on the right hand side of the blog. 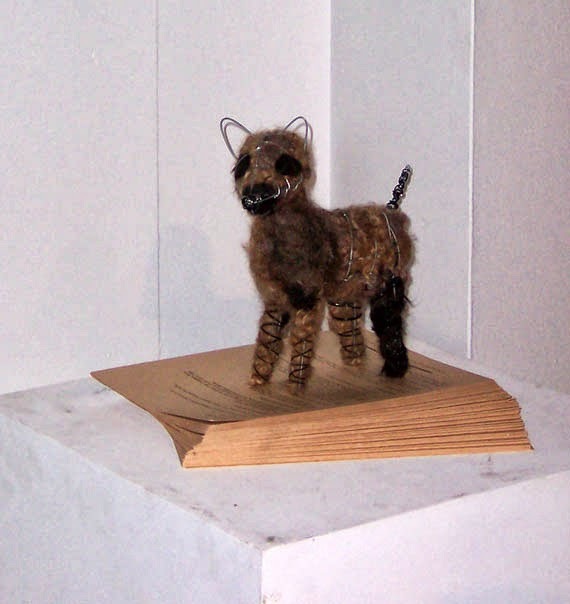 My art, my poodles, my Pinterest, I have a Made by Me and a Made by Him board on Pinterest.